For the makers of Saawan, the vital part was delivering their message. Their heart is in the right place, which makes it a praise worthy effort. 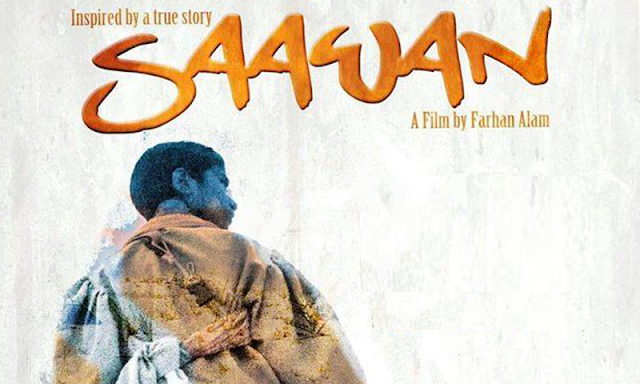 Directed by Farhan Alam, the movie looks at the life of a disabled boy named Saawan (Karam Hussain), left behind in his village when his parents and all village dwellers leave for the city due to famine. The story revolves around the survival of the boy and the friends he makes along the way. Will he survive or the extremely challenging environment and other forces take his life? Shot in the high terrains of Baluchistan, there are many scenes in Saawan, which will leave you in awe. The mountains, the deserts and the lakes are captured stunningly and the DOP has done a brilliant job. Pakistani filmmakers are not only highlighting, social issues but also showcasing how beautiful some of the neglected areas of Pakistan are. Laadak's (India) was one such example, where a film (3 Idiots) changed the fortunes of the local population as tourism shot up. Coming back to the story of the film, it tries to highlight many varied grave issues. The treatment of a differently-abled person in the film is quite reflective of how our society treats them. So is the very apparent sexism and misogyny. Its borders on child and women abuse. How sardars, in rural areas rule without impunity and the state bends to their wishes. It touches on the polio epidemic and how polio eradication teams have been targeted in our country. Child trafficking is also under the microscope as Saleem Mairaj playing a child trafficker, gives the role the necessary impetus. Despite only being in the quarter of the film, this character is most developed and I am pretty sure audiences will come out of the cinema hating him. In the backdrop, but a key part of the plot is a man, who has been cast aside from the village, tied down to a bed away from the settlements because of his mental disability. The villagers call him ‘Bala’. It illustrates how difficult it is for refugees to become part of their new home and lead a normal life. Moreover, the heartless attitude of the public as well as authorities towards those in need is also a stark reminder of the society we have developed. The role of media and censorship issues also get a mention. Lastly, there is the film touching base of the very real threat of terrorism. As one might think these are very many issues to divulge into in two and half hours. This is a bit of a problem with the film. As it aims to discuss so much, it goes dull especially in the 2nd half. There are roles and sequences which could be cut out entirely i.e. Media personnel and the power struggle between children at one point of the movie. With better editing, and more focused direction, Saawan could have been a bit shorter and delivered a more powerful message. In its current form, it can leave the audiences a bit overwhelmed with the sheer number of plots. Nevertheless, all performers, Arif Bahalim, Najeeba Faiz, Imran Aslam, Tipu Yorguc, Hafeez Ali and Shahid Nizam play their roles aptly. To sum up, Saawan I presume was very challenging to shoot and on a topic which isn't very commercial. The makers of the movie wanted to deliver important messages & they have managed to do it. It’s a praiseworthy effort which could have been better. Good couple of weeks for Pakistani cinema followers.